Many of the antennas I've described on this blog include a simple or an elaborate switching systems. These are useful for direction switching in low band multi-element antennas, selection of receive antennas and for stacked yagis (e.g. up, bottom, both). The more elaborate switching systems consist of many relays whose operation must be orchestrated so that every array element is correctly configured and the antenna behaviour can be switched with low-voltage cable from the operating position that may be 100 meters or more distance from the antenna. Switching matrices for antennas are straight-forward and use common components in a repetitive pattern. Even so it is worthwhile to pay attention to details. With the low-band directional receive and transmit antennas I aspire to build in my next station this is a topic that will become a priority. Some experimentation with these devices is time well spent. The transmission line cannot be easily used for this purpose since there may be many configuration states and there is only one DC path (assumes a bias-T to allow coax to carry both RF and DC). Instead we use a multi-conductor cable with one common wire and other wires assigned to each configuration state. For example, in the 3-element vertical yagi for 80 meters I earlier described the cable would require 7 wires: 1 common; 4 for each antenna direction (unpowered it is in omni-directional mode); 1 to select CW or SSB band segments; and 1 to select 160 meters. Since a picture is reputed to be worth 1,000 words I'll reproduce the schematic of a switching matrix taken from ON4UN's Low-band DXing book. I chose this one for its clarity and no other reason. Also, I was reminded of the book when I had a short QSO with John on 20 CW while writing this article. In this matrix the common line is negative; it can be the positive line if you prefer and you do not share a common return path with the coax outer conductor. One of the horizontal wires is energized by the operator activating a switch. Each relay coil has a vertical conductor to complete the matrix. A switching diode is placed at the junction of each horizontal and vertical line where for that operator selection the relay is to be energized. Depending on the application the relays and what they switch can be quite different, however the circuit topology remains the same. I think any ham looking at this schematic would quickly understand it despite its size. The topology is straight-forward and the circuit elements are basic. Perhaps there's nothing to learn here, just a standardized approach for those planning switching arrays for receiving antennas or even wire yagis. There are other topologies possible, such as those requiring fewer wires but requiring binary coders and decoders. Since a long run of small gauge wire is inexpensive it is rarely worth the added complexity. As you can see it doesn't need to be pretty! The components of the test bed include a punch-down prototyping board and a bundle of switching diodes. This board is large enough to prototype a switching system with 5 or 6 relays rated for 10 A. The 3 A PCB-mount relay looks tiny compared to the board. It was purchased only for the purpose of testing the test bed. Wires, power supply and multi-meter were already in my workshop. I grabbed wires from my junk box that were already suitable for the task rather than make new ones. That contributes to making it look messy. Colour-coded wires cut to size are recommended when building a prototype. 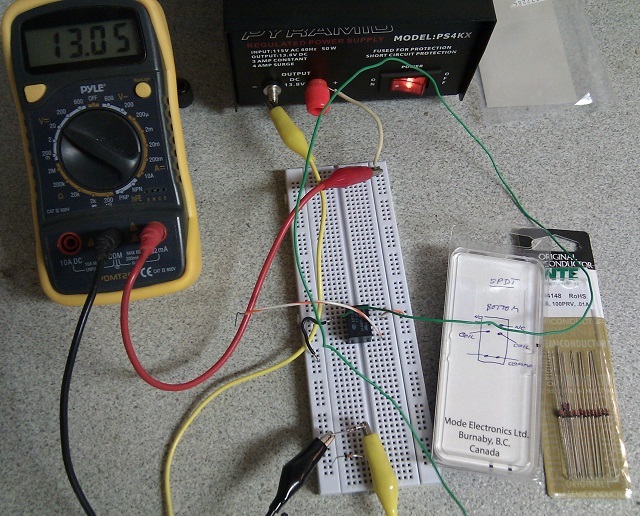 The multi-meter in the photo is measuring DC voltage across the relay coil. At other times it was in resistance mode to monitor contact open and closure. Now that the test bed is built let's review the ways in which it can be used. There was a time when semiconductors, relays and other components that were available retail had a DOA rate of several percent. Even though this has improved there is some comfort to be had by testing relays and diodes before soldering them to the PCB. Some use sockets for relays, but that can be expensive and introduces another source of future trouble: contact corrosion. Not all relays have their terminals labelled. The one I purchased doesn't. The test bed can be used to identify the terminals. You can see that I drew a diagram to record what I found. Make sure that all the relay contacts -- NO for normally open and NC for normally closed -- show the expected zero or infinite resistance in each state. It can even be useful to test diodes since the cathode marking may be unclear unless you are familiar with the component and its package style. I mounted two diodes in opposite directions to confirm the markings are as expected. The prototyping board has a similar layout to off-the-shelf pre-drilled PCBs. There are just fewer bus lines, thus requiring more jumpers. After the full prototype is built take a picture of it and transfer the components to the PCB, retaining the same positions. Solder and test in stages and you're done. Keep in mind that the orientation of the diodes (direction the cathode faces) depends on whether the circuit uses the negative or positive DC bus as the common point for all the relay coils. Relays and diodes are simple components yet they do have ratings you should be aware of. These can be tested. First, you should check two voltages of relay operation: turn-on and turn-off. The first is the minimum voltage to positive relay closure. The other is the voltage below which an energized relay full opens. These can be read from the spec sheet if it is available (typical values are 70% and 20%, respectively). But that may be impossible for old stock or parts pulled out of a junk box. The more forgiving the relay operating voltages the more flexibility you have in choosing long runs of small gauge wire. By turning off the power supply and watching the voltage drop I estimated at most 3 volts when the relay opened (< 25%). I didn't measure the turn on voltage. Second, you need to account for the diodes. Notice in the picture the voltage reading is 13.05 VDC even though the power supply is 13.8 VDC. A silicon junction has a forward voltage drop of 0.7 volts (±0.2 depending on current and temperature). The multi-meter probe is connected to the relay side of the switching diode so that the voltage drop can be seen. When multiple relays are energized by one diode the diode current and power ratings can become important. The 1N4148 diodes I am using have a current rating of 200 to 300 mA. The coil of the test relay has a DC resistance of 700 Ω (measured as 680 Ω). For a supply voltage of 12 VDC (e.g. 13.8 minus wire loss), leaving 11.3 VDC across the coil, the current through the circuit is 18 mA, with the diode dissipating 13 mW due to its 0.7 volt drop. This isn't much. However this is a small relay. For a typical 10 A rated SPDT relay for this RF application (e.g. Omron G2RL: 12 VDC, coil resistance 360 Ω) switching systems the current is 31 mA and the diode dissipates 22 mW. Multiply these amounts by the number of relays simultaneously energized by one diode in the matrix. Go beyond a diode load of 6 relays and you might run into trouble, or even with fewer relays on a hot day when the temperature soars inside the enclosure. A higher capacity switching diode may be desirable in those cases. The 3-element vertical yagi for 80 meters comes close because the switching matrix powers up to 2 relays (float and reflector/director) at each of the 4 parasitic elements. I now enter the summer season. Expect the pace of articles on the blog to slow during the next 2 or 3 months. It's not just summer but also that some changes are afoot, about which I expect to say more later as my plans firm up. I also have a trip back home to VE4 coming up very soon. I may come back with a few pictures related to amateur radio, something I neglected to do on my previous trip west. For those operating in ARRL Field Day this weekend, have fun out there. From past experiences I've decided to avoid operating out of doors since it doesn't agree with me. I have many stories of past FD misadventures that only seemed funny to recount well after the fact. I enjoy outdoor adventures and amateur radio, just not at the same time!